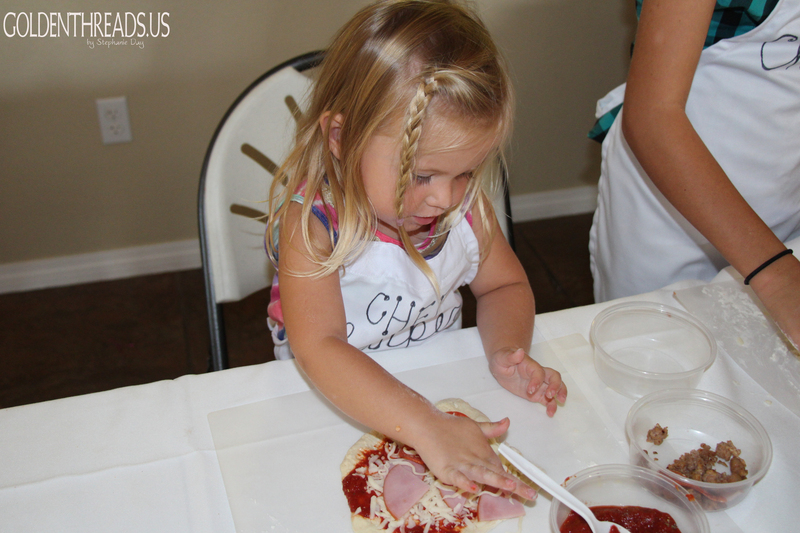 The TV show Master Chef Jr. came back on the air this week for its second season, so I think it’s fitting to highlight our recent party inspired by the show. 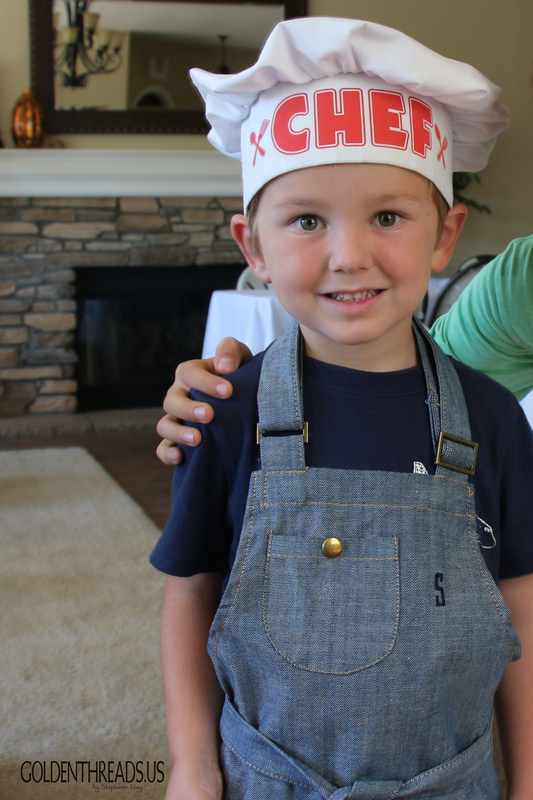 Our son Sawyer just turned 5 and he told us he wanted a chef party (after about a solid month of being sure he wanted a tank party.) But he loves to cook and Master Chef Jr. is one of his favorite shows so we went with it. 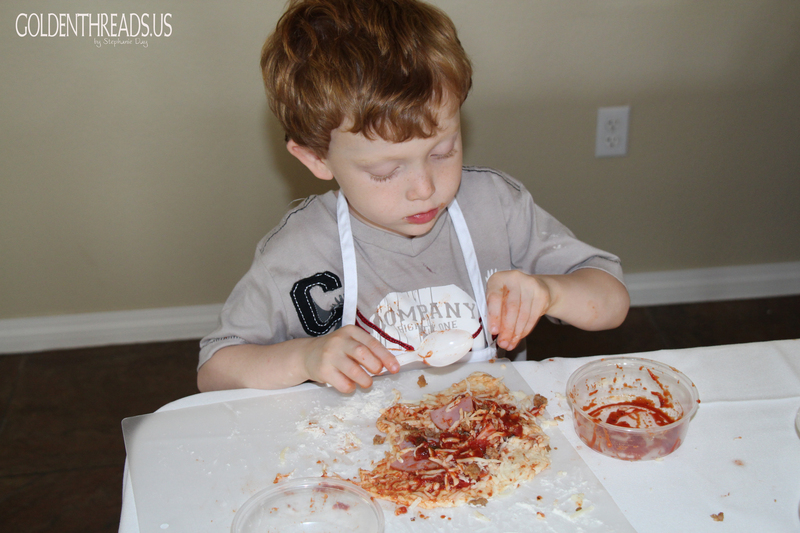 He says lately that when he grows up he either wants to be a chef or a Junior High Pastor (like his dad.) We decorated with simple things like a “Specials Board” including fun facts about the birthday boy. We used an IKEA easel that we already had and a couple of chalkboard markers that I found at Michaels. It also helped to have friends with great writing skills (Sarah & Allegra) come early to help set up. My friends and family know me well enough that many of them arrive early to help, knowing that I have big dreams and a tendency to underestimate. This party was no exception! 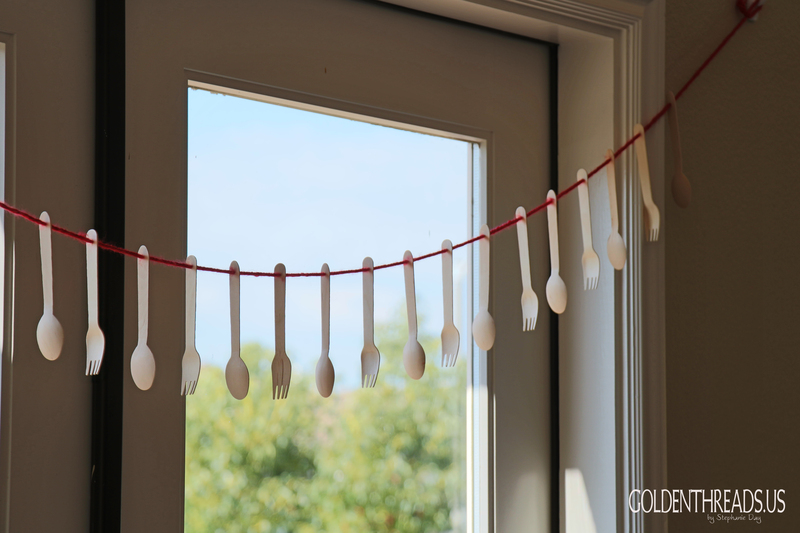 I also bought some wooden spoons and forks on amazon.com to use as garland. My friend Maggie was in town from Seattle and graciously drilled little holes in each utensil and strung them from red yarn. A bit tedious, but inexpensive for sure! We also used our ever-useful box of mason jars as drinking glasses and dressed them up with daisy lids and red stripey straws. I love when the functional things also qualify as decorations. Sawyer was set on the idea of having a “mystery box challenge” and having the grown-ups be the judges. This kind of party would be ideal for older kids or adults, but since we were working with kids aged 2-12, we kept the spirit of the show while toning down the skill level and the competition. 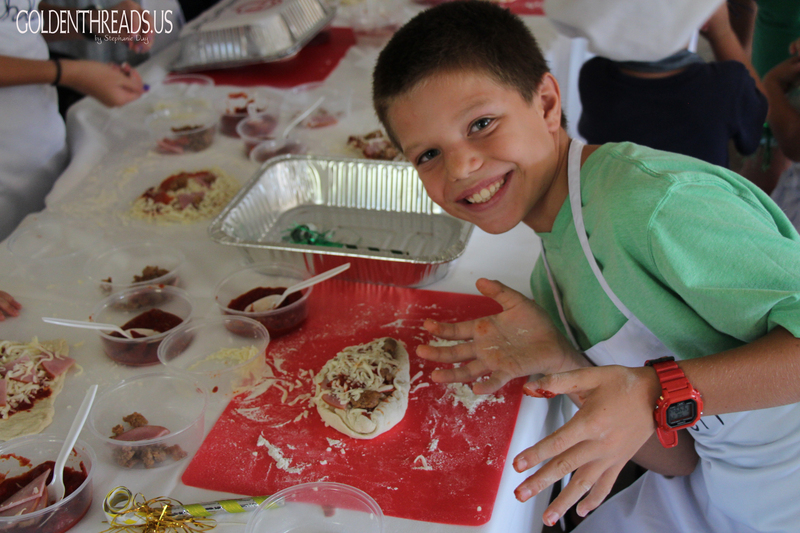 Each “chef” had their own mystery box that contained a ball of floured pizza dough, sauce, cheese, and an array of toppings. And then on cue, they all went hog wild. A few pizzas had to become calzones in order to be baked. I heard the adult “judges” giving lots of awards for creativity and use of ingredients. We had two ovens going and the kids loved getting to eat the dinner they had made. 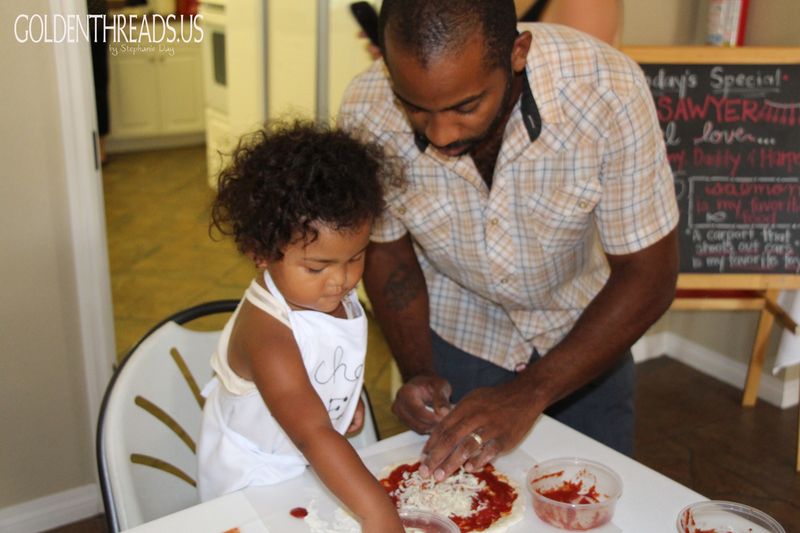 As soon as the kids were done with their fabulous chaos, we had the adults head to a pizza making bar of their own. 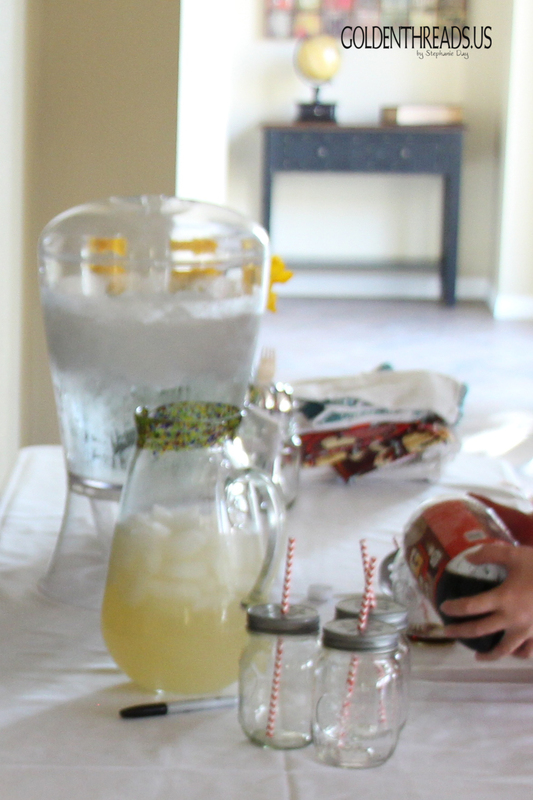 We tossed a few salads, had mason jars full of lemonade and root beer and called it dinner! 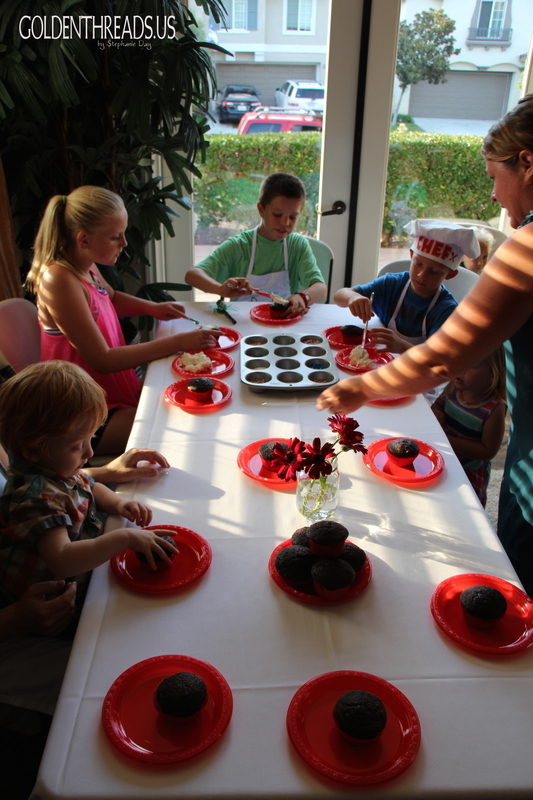 For those who still wanted some “cooking” to do, we had a simple cupcake decorating station a bit later. 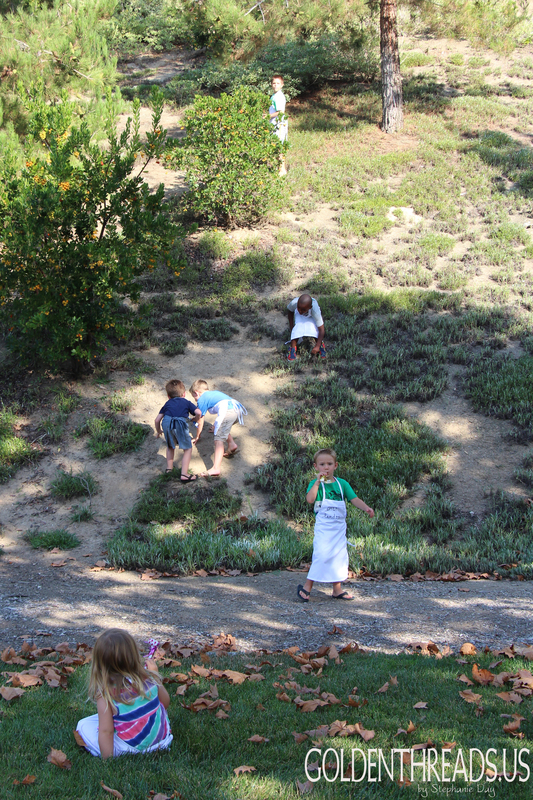 The chefs blew off some steam by running up the hillside in their aprons (our party “favors” were aprons with their names written on them) and then by hitting the piñata. 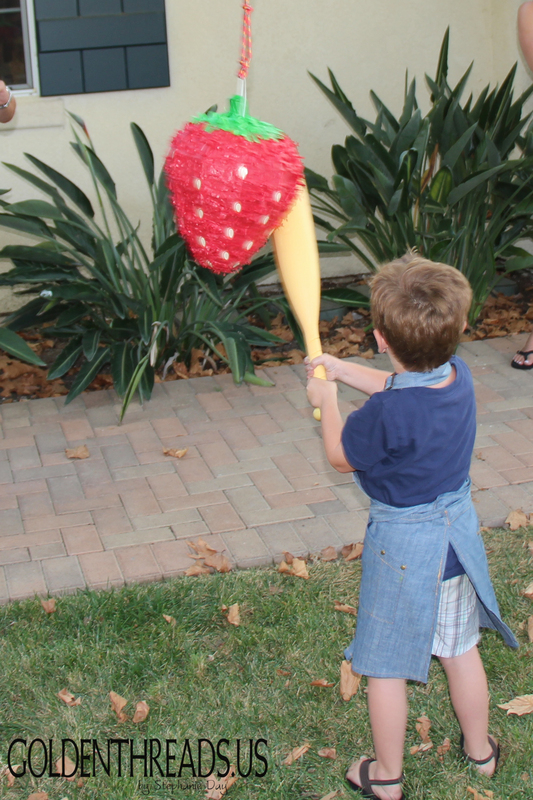 Since this was a food party and Sawyer particularly dislikes fruit, we thought it perfect that he get to beat the heck out of a strawberry on his birthday. And if you think a kid who hates fruit is unusual, then how about a 5 year old whose favorite food is salmon? Sawyer’s favorite meal right now is salmon with a side of broccoli sprinkled with red wine vinegar. Seriously. So, my husband Brian came up with the idea to make a cake that looked like a salmon and thankfully he took the head chef role on the project. 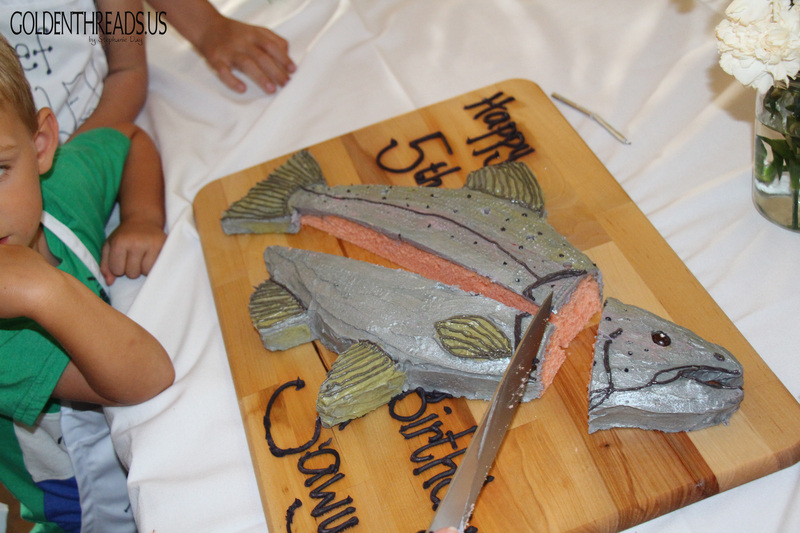 I gladly took the sous chef role and together we created this crazy cake for our little seafood lover. We served it on a cutting board so that “Chef Sawyer” could cut the head off and then “filet” it a bit. Somewhere in the process of dreaming up this cake, Sawyer promised his 2 year old sister that she could eat the head. Her ballet birthday party is coming up at the end of the month and I already heard her tell Sawyer that he could have the “leg of the ballerina” since she got the head of his fish. Well, isn’t that sweet? We had loads of fun and it was one of those parties where the party favors were functional, the food was the activity and everyone got to be creative. A win on many levels. 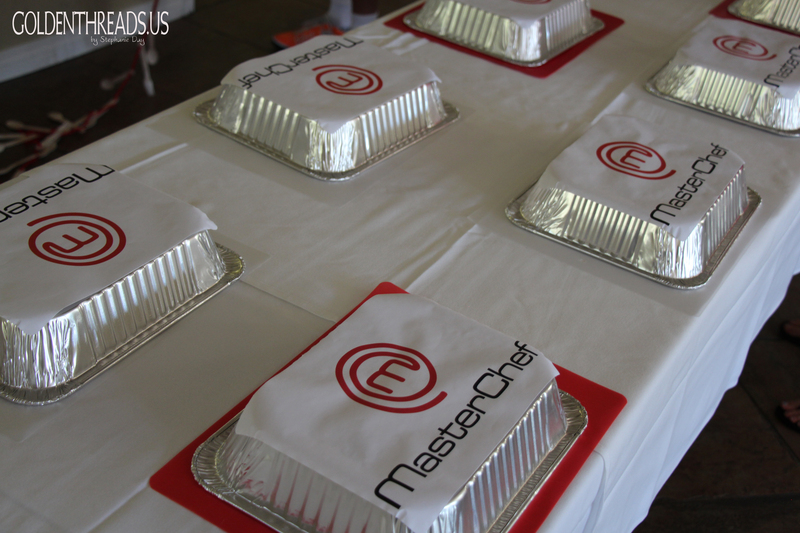 Tune into FOX this season for Master Chef Jr. and watch some incredible talent from kid chefs. They’ll amaze and inspire you! 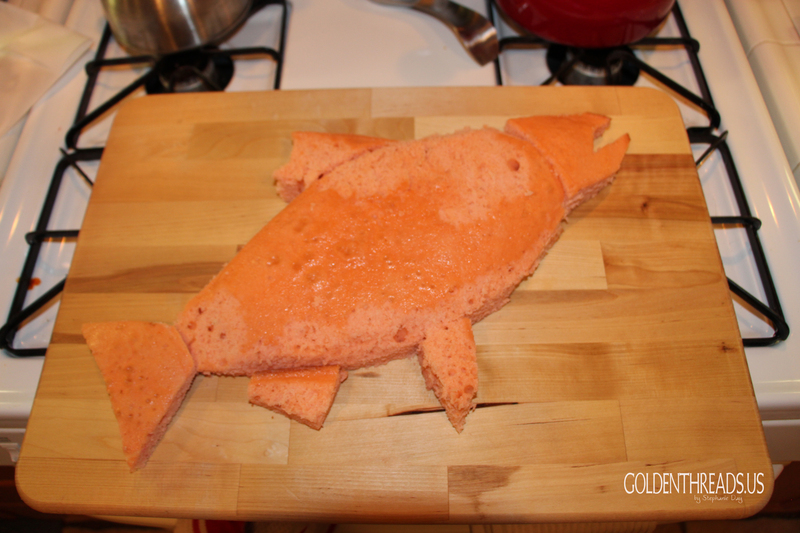 Here are some tips for making your own salmon cake- or whatever kind of cake you dream up! We started with a favorite vanilla cake recipe that we’ve used many times. It seems to have a good density for “building” if you know what I mean. You can use a cake mix but sometimes they turn out a little spongier and are harder to make shapes with. We then tinted our batter with some orange and pink food color gel to get a salmon color. We baked in a few different pans to get the length and different “pieces” that we wanted. In the past, I have used glass bowls, bundt pants, loaf pans, etc. Whatever will give you the thickness and shape you want. 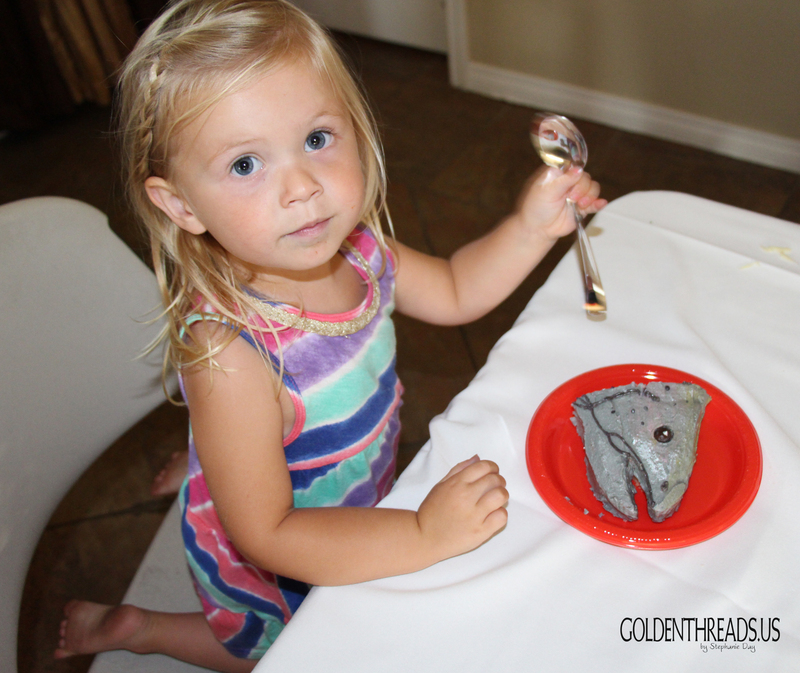 Cake is easy to cut and piece together so be creative! We made white icing and tinted it gray using black food color gel. We covered the whole fish to join the pieces together. If you are icing directly on the serving platter, a good tip is to tear small pieces of parchment and tuck them under all the edges so that you don’t get icing on the board. When you’re done with all the edges, just gently slide the parchment pieces out and you’ll get great clean edges. 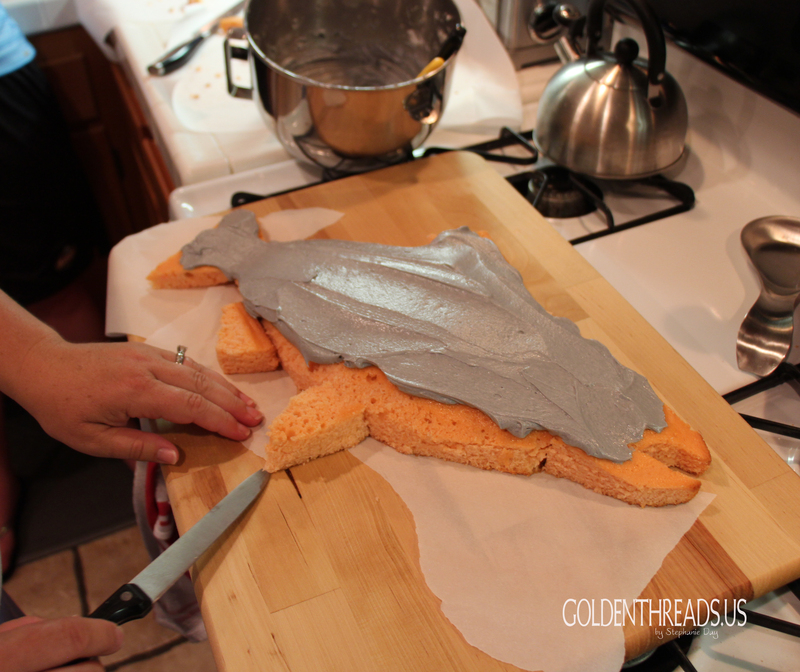 We then added some green and then brown to the gray icing and made a little pink to give the fish some other colors. We piped a dark brown in for detail and then popped a chocolate covered espresso bean in for the eye. 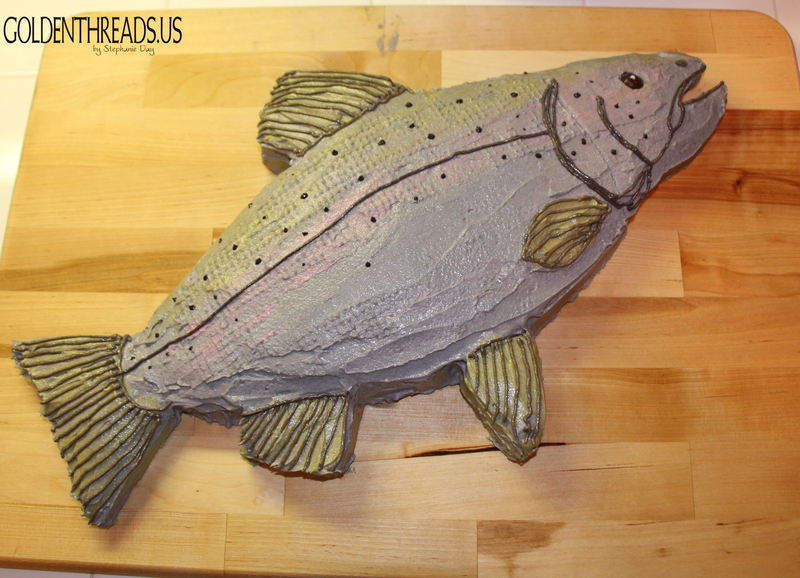 We wanted texture for scales so I found a roll of that bumpy shelf liner stuff, washed and dried a sheet of it and laid it on the fish. Pushed gently and pulled straight up. It worked! We finished the fish with some of “Linnea’s Luster Dust” in silver that I got at a cake decorating shop to give it an iridescent finish (yes, it sounds dirty and yes, we made jokes.) Viola! 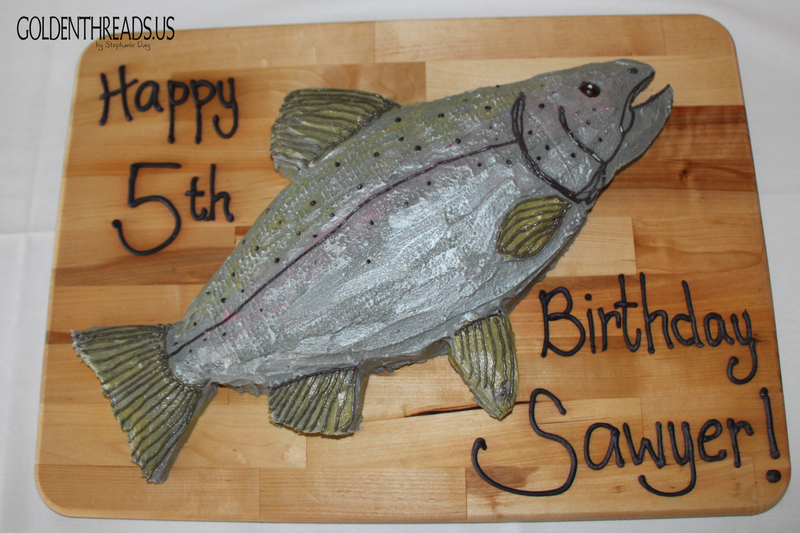 A salmon birthday cake.